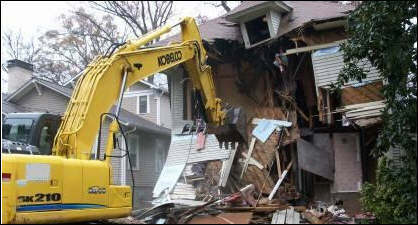 Demolishing a single family dwelling can take only a day or two with the right expertise and equipment. When most people think of "demolition," they conjure up images of a giant wrecking ball taking down an office tower. However, many demo jobs simply involve tearing down a single family house, a dilapidated detached garage, or similar structure. Condemnation – The local Code Enforcement Agency may be levying fines against you for a dilapidated dwelling. Southern Demolition and Environmental has demolished hundreds of structures. We distilled our years of experience into this series, Top 10 Tips for Demolishing a House, designed to help you understand the components and scope of a demolition project. Utilize this scope in comparing bids, questioning contractors, and ensuring that your project is completed professionally. If you do choose to select a demolition professional to complete your demolition project, we hope you'll consider hiring Southern Demolition and Environmental. We will take these 10 steps and reduce them to one decision – the selection of our organization for turnkey demolition services. We will post a new tip every four days over the next month. Check back for more updates!